Anaxagoras (/ˌænækˈsæɡərəs/; Greek: Ἀναξαγόρας, Anaxagoras, "lord of the assembly"; c. 510 – c. 428 BC) was a Pre-Socratic Greek philosopher. 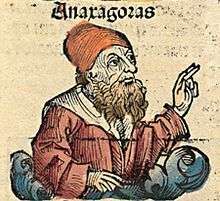 Born in Clazomenae in Asia Minor, Anaxagoras was the first to bring philosophy to Athens. According to Diogenes Laertius and Plutarch, in later life he was charged with impiety and went into exile in Lampsacus; the charges may have been political, owing to his association with Pericles, if they were not fabricated by later ancient biographers. Responding to the claims of Parmenides on the impossibility of change, Anaxagoras described the world as a mixture of primary imperishable ingredients, where material variation was never caused by an absolute presence of a particular ingredient, but rather by its relative preponderance over the other ingredients; in his words, "each one is... most manifestly those things of which there are the most in it". He introduced the concept of Nous (Mind) as an ordering force, which moved and separated out the original mixture, which was homogeneous, or nearly so. Anaxagoras is believed to have enjoyed some wealth and political influence in his native town of Clazomenae, in Asia Minor. However, he supposedly surrendered this out of a fear that they would hinder his search for knowledge. The Roman author Valerius Maximus preserves a different tradition: Anaxagoras, coming home from a long voyage, found his property in ruin, and said: "If this had not perished, I would have." A sentence, denoted by Maximus, as being "possessed of sought-after wisdom!" Although a Greek, he may have been a soldier of the Persian army when Clazomenae was suppressed during the Ionian Revolt. In early manhood (c. 464–461 BC) he went to Athens, which was rapidly becoming the centre of Greek culture. There he is said to have remained for thirty years. Pericles learned to love and admire him, and the poet Euripides derived from him an enthusiasm for science and humanity. Anaxagoras brought philosophy and the spirit of scientific inquiry from Ionia to Athens. His observations of the celestial bodies and the fall of meteorites led him to form new theories of the universal order, and to a putative prediction of the impact of a meteorite in 467 BC. He attempted to give a scientific account of eclipses, meteors, rainbows, and the sun, which he described as a mass of blazing metal, larger than the Peloponnese.The heavenly bodies, he asserted, were masses of stone torn from the earth and ignited by rapid rotation. He explained that, though both sun and the stars were fiery stones, we do not feel the heat of the stars because of their enormous distance from earth. He was the first to explain that the moon shines by reflecting the sun's light. He thought that the earth is flat and floats supported by 'strong' air under it and disturbances in this air sometimes causes earthquakes. These speculations made him vulnerable in Athens to a charge of impiety. Diogenes Laertius reports the story that he was prosecuted by Cleon for impiety, but Plutarch says that Pericles sent his former tutor, Anaxagoras, to Lampsacus for his own safety after the Athenians began to blame him for the Peloponnesian war. According to Laertius, Pericles spoke in defense of Anaxagoras at his trial, c. 450 BC. Even so, Anaxagoras was forced to retire from Athens to Lampsacus in Troad (c. 434–433 BC). He died there in around the year 428 BC. Citizens of Lampsacus erected an altar to Mind and Truth in his memory, and observed the anniversary of his death for many years. Decease and growth represent a new aggregation (σὐγκρισις) and disruption (διάκρισις). However, the original intermixture of things is never wholly overcome. Each thing contains in itself parts of other things or heterogeneous elements, and is what it is, only on account of the preponderance of certain homogeneous parts which constitute its character. Out of this process arises the things we see in this world. 1 2 3 4 5 6 7 8 This article incorporates text from a publication now in the public domain: Chisholm, Hugh, ed. (1911). "Anaxagoras". Encyclopædia Britannica (11th ed.). Cambridge University Press. This article incorporates text from a publication now in the public domain: Chisholm, Hugh, ed. (1911). 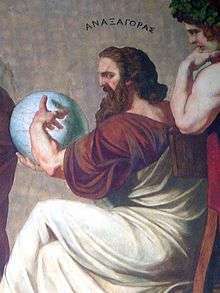 "Anaxagoras". Encyclopædia Britannica (11th ed.). Cambridge University Press. Davison, J. A. (1953). "Protagoras, Democtitus, and Anaxagoras". Classical Quarterly. 3 (N.s): 33–45. Filonik, Jakub. (2013). "Athenian impiety trials: a reappraisal". Dike: rivista di storia del diritto greco ed ellenistico 16. Curd, Patricia. "Anaxagoras". Stanford Encyclopedia of Philosophy.